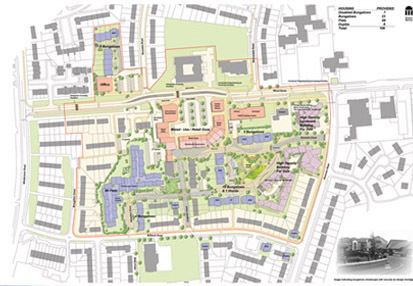 This scheme is part of an inset master plan which includes a new retail area, community buildings, private sector housing development, demolition of tower blocks and the creation of a new village. The village will consist of a mixture of bungalows and apartments. The level of care provision is currently a matter of further study with Rochdale MBC and Bowlee Park Housing Association. This �15m housing scheme will incorporate a major Cat 2 / frail elderly block as part of a flagship proposal in the regeneration of the Langley Estate which forms part of the Oldham / Rochdale Pathfinder Area. There is therefore strong emphasis on the quality of Public Realm as well as the quality of the buildings. Land around the tower blocks is cramped should development take place in close proximity and as a consequence health and safety issues in respect of demolition have, by necessity, had an influence on the design layout.